Thanks to everyone who came out to Hilliard Lakes in Westlake for the annual alumni golf outing. We had great weather, great food, and great prizes! Thanks again to our 2009 sponsors! Save the date for next year's event: The last Saturday in June. Keep an eye on Cleveland Bobcats.com for details about this and other alumni activities. Some photos from last night's Major League Monday . . . In the stands . . .
Golfers: Early Registration Ends Soon! This is the last week to save money by registering early for the OU alumni golf outing! Until Saturday, the fee is just $75 per golfer/$300 per foursome. 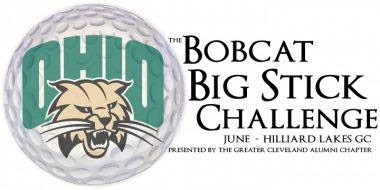 This fun event includes 18 holes, lunch, and dinner, plus your chance to connect with other OU alumni and friends. Have we mentioned the prizes?! Don't miss Major League Monday (June 15) with fellow OU alums! All fans get a Rick Vaughn "Wild Thing" bobblehead. Come early for a special pregame ceremony featuring Bob Uecker. Stick around afterward for a totally awesome '80s fireworks show. Note: If you already have tickets to the game, be sure to stop by our pre-game get-together for your chance to win some OU swag! Just $7 for pizza and other apps; cash bar available. The pre-game event starts at 5 p.m. on Monday, June 15; first pitch is scheduled for 7:05 p.m. Pre-game event is at Flannery's (4th & Prospect). This includes the game ticket, the pre-game event, and a small donation to the OU chapter's scholarship fund. by June 14 to reserve your seats.